Do you have a specific color preference and if so, what draws you to that particular color? I just can’t seem to choose one color, such as red or green. My favorite seems to be a variation of hues, almost a combination of things, really. Mostly, experiences and things I love seem to come into play here. If I got put on the spot and someone asked my favorite color, I might just say “pink” to save them from the drawn out version of what pink to me actually entails. It’d be like lining up all of your beloved pictures and trying to explain the color scheme. Sometimes it’s hard to choose! I love the many shades of pink. My pink is the fuchsia sort of pink of our Moss Rose’s petals. It’s the earthy glowing pink, with splashes of yellow and orange, yet a hint of blue, in the sunset Little Bit and I saw on Christmas eve. Add in the old fashioned pink of grandma’s rose bush. That same bush she transplanted from across the road years ago and didn’t think would live. Would you believe it has shown up blooming every summer since that fateful day? Then, there’s the closet. 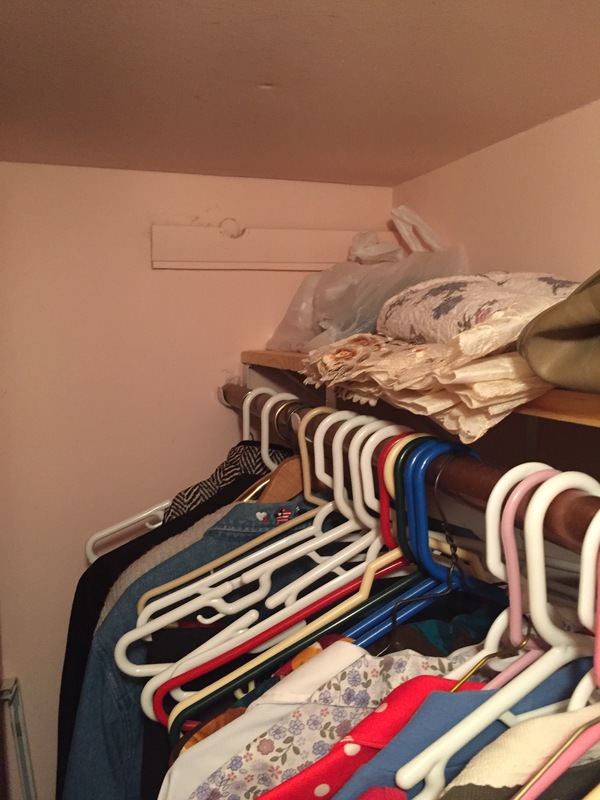 One summer, grandma let me help her paint her closet pink. That’s kind of a big deal. You see, she had a house full of boys! Six of them, to be exact. One girl in a family of eight? She needed a little pink. Helping her paint that day is one of my most treasured memories. As most of you know, grandma passed away recently. A few months before, while she was in the care facility, the water pipes in her farm house broke and did a lot of damage. That resulted in a pretty major renovation. The floors, carpets, and countertops had to be replaced. At the same time, the walls received an update: new paint. I kept hearing how different her house looked, and honestly, I didn’t know if I wanted it different. Maybe that sounds a bit selfish, but I wanted her in her house, with everything the same, so my memories of our lives there would match up. I was a bit afraid to go there and see the changes. I went anyway. It was different, really different. A lot of her furniture was gone, and what was left was rearranged in every room. I felt my heart sink a little. I went into her bedroom. It was familiar, kind of. The dressers were switched around and her jewelry boxes were gone. The framed art that grandpa had given her over seventy years ago, was still in the room, but moved from its spot. I bit my lip, as I stepped to the closet. I almost didn’t stop, for fear my heart would break upon opening the door and I’d be standing in a puddle of tears. Then, I decided to look anyway and slowly opened the door. Wooooooo hoooooooooo!! It was pink! Pink, pink, pink, pink, pink!! I ran and got my mom! “Look, look, look!” I said. I’m pretty sure there was never a happier granddaughter at that exact moment. And, I was standing in that puddle of tears, but they were happy tears! They say that our love of colors can be tied to our emotions. I believe it. I will be forever grateful that her closet is still pink. Makes me wonder though, what would my favorite color be if we had painted her closet another color, say yellow? Aw! Thank you so much! :) Orange is a great color to choose! Please let me know if you find a memory connection. That’d be cool if you do. When I was a little girl, my maternal grandmother’s carpet in her living room was pink and black. She had a black couch with black and white chairs to accent. I will never forget my favorite black and white colored rocking chair in her living room. She had pink drapes that matched the pink of the carpet. I can still see that living room in my mind’s eye. Then came the days that she requested help with remodeling her home and that living room was changed from pink and black to green and blue. I missed the pink and black! The room never looked or felt the same again. However, she was so pleased and proud of that green and blue living room. Sometimes, after I became an adult, I realized that she had memories with that pink and black room that revolved around when my grandfather was still alive. She loved him with every ounce of her being but I believe she needed to change the décor in that room to move on with her life. Oh my goodness, what truly inspiring story. Your description put me “in” the room and I was able to imagine how beautiful that must have been. Oh, wow! Thank you so much. I guess all those years of sitting around her maple kitchen table listening to her stories rubbed off! Your words are beyond a compliment, to even be compared to grandma is a gift. Thank you for that! P:S. You got me with big yellow house. LOVE THAT PLACE!